Right Laying Application without debonding, deformable and dislodged problems. Today, there are many choices of durable and good price flooring materials, ceramic tiles which are the top selection has many various sizes as preferences. However, the tiles lifetime whether will last long or not, caring tiling comes importantly first. Our country is in a tropical zone makes flooring materials shrink which are varied on day time and night time. The traditional mortar application (mixed cement) is another preferable tiling method by more than 80% of tile fixers because of easy and quick laying effects. Problems caused by traditional mortar application; when applying mortar in lumps at the middle of tile back without adhesive texture under the rim, or underneath tiles edges, only the hollows remain. So, tiles edges are always chipped when hit by heavy items and will be easily dislodged later on. This application shorten tiles lifetime. Tiling by applying traditional mortar in lumps at tile back (mixture of cement & tile adhesive): This application is similar to leveling plane as using less water and no dirt. However, the problems such as debonding and short tiles lifetimes still arise. 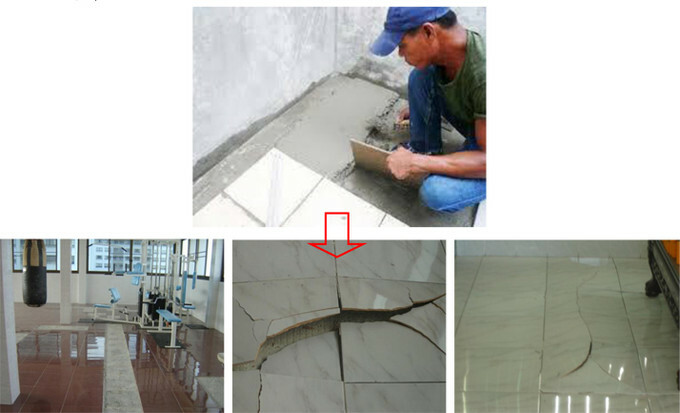 Tiling with tile adhesive+notched trowel: This laying application is the most efficient application nowadays because it makes tiling use less time and less adhesive but creates great bonding strength and long lasting lifetime more than decades. Therefore, this is the right application choice which is cost saving, cost-effective for this current high cost of living and labour shortage.